When you tell someone you’re an Ethical Hacker, they look at you like you are some kind of a Wizard. Well, that’s what it is to be an Ethical Hacker: Knowledgeable, Powerful and Conscience to do the right thing! Like a Wand to a Wizard, Python makes an Ethical Hacker more powerful. In the previous tutorial, you saw how you can write a MacChanger using Python. 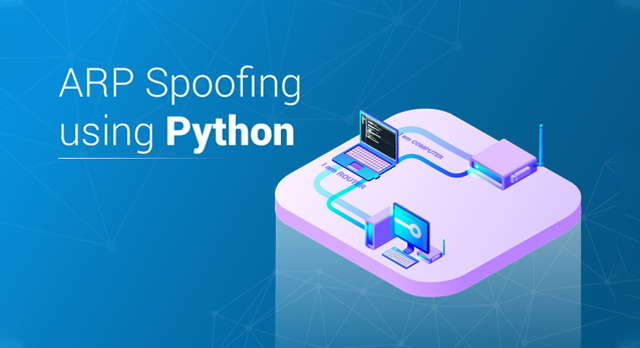 In this tutorial, you will see how Python can be used for ARP Spoofing. 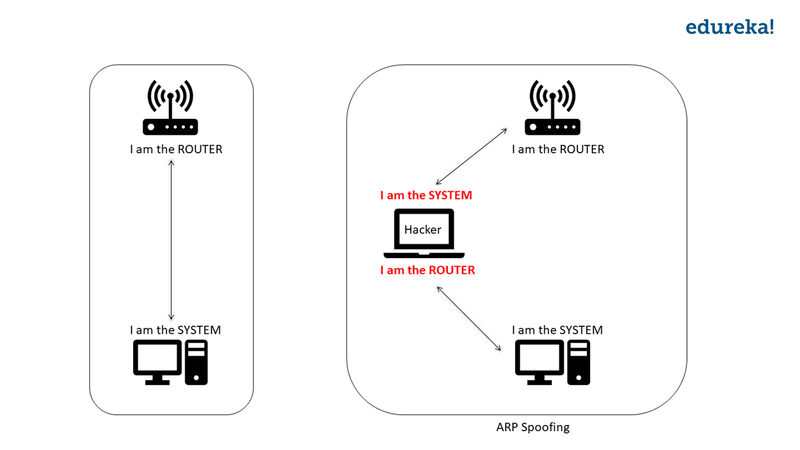 I know you are all hyped up to automate Ethical Hacking, but first, you should know what ARP Spoofing is. It is common that everyone uses WiFi these days and you are one of them. Do you know how the data flows when you are connected to the router? Your system and the router have IP addresses attached to them. When you are connected to the router, the data flow is between 2 IP addresses. The router sends data to the IP address of your system and your system sends data to the IP address of the router. ARP Spoofing is the technique of redirecting the network traffic to the hacker by faking the IP address. Too technical? Let me make it simple for you. When there is a connection between a system and the router (basically between two IP addresses), the hacker will fake his/her IP address. The hacker will tell 1) The Router that he/she is the system and 2) The System that he/she is the router. Now, the router will send the data to the hacker instead of the system, and the system will send the data to the hacker instead of the router. Hence the network flows through the hacker. Now that we know what an ARP Spoofer is, let’s build these using Python! When I was explaining to you about ARP Spoofing, I told you that it redirects the traffic. To conduct ARP Spoofing, we need 3 nodes. One will be the hacker node and the other two are systems between which there’s some communication going on. For this tutorial, I am using Virtual Machines to create nodes. I will run two Virtual Machines of which one will be the hacker and the other will be the victim. What about the 3rd node? Well, that will be the router that the Virtual Machines are connected to. My setup is as follows: I have two Virtual Machines which are connected to a router. Before we write an ARP Spoofer, we need to get some data. Because the hacker system will be faking it’s IP address, we should know the IP address and the MAC address of the router and the victim system. This will list the IP address and the MAC address of all the systems in that network. Here, the gateway is the Router and for this demo, I will choose the system with the IP address 192.168.111.157 as the Victim. After we run the ARP Spoofer, we need a way to verify whether our ARP Spoofer worked or not. In the real-world scenario, the success/failure of the ARP Spoofing is determined by the output on the hacker’s system. But for this demo, we will make it easy. As we are running Virtual Machines, I will switch to the Victim system and check the MAC address of the Router. Look at the MAC address of the router, this will change after we run the script. Now that we have the required data for spoofing, we are ready to write an ARP Spoofer. 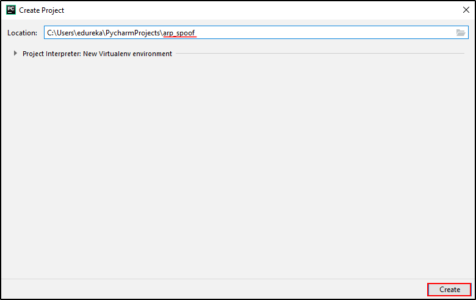 To write a Spoofer for ARP Spoofing, let’s run PyCharm. 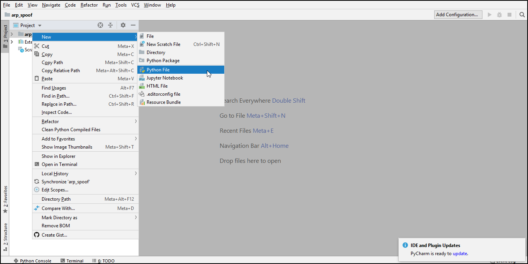 To start PyCharm, go to the directory where PyCharm was extracted and run the shell script. Enter a name for your project. I will name this arp_spoof. And then click “Create“. You will now see the workplace. Next, let’s create a Python file. To do this, right click on the project name, go to “New” and click on “Python file“. You can now write the Python script here. The ARP Spoofer I am writing will use the Scapy module of Python, that is a packet manipulation tool. scap.send(packet) #Packet telling the Router (with ip address 192.168.111.2) that the hacker is the Victim. You can see that the MAC address of the Router’s IP is changed to the MAC address of the hacker’s system. This means that the network is getting redirected to the hacker and the data from the Victim’s system is going to the hacker’s system thinking that it is the Router. Congratulations! You have written an ARP Spoofer in Python and seen it in action. If you wish to check out more articles on the market’s most trending technologies like Artificial Intelligence, DevOps, Cloud, then you can refer to Edureka’s official site. Do look out for other articles in this series which will explain the various other aspects of Ethical Hacking. Originally published at www.edureka.co on March 4, 2019. There are many e-learning platforms on the internet & then there’s us. We are not the biggest, but we are the fastest growing. We have the highest course completion rate in the industry. We provide live, instructor-led online programs in trending tech with 24x7 lifetime support.